If you want to read an updated version of this post, see Grad Student Tax Lie #6: You don’t have to pay tax on the scholarship that pays your health insurance premium on Personal Finance for PhDs. Kyle and I haven’t filed our taxes yet this year – perhaps because of laziness/procrastination but chiefly because we haven’t yet agreed on our reportable income! The “income” under question is the money used for our health insurance. One of the charges posted to our Bursar accounts through our university every year is for our health insurance, and it is paid by our departments through the accounts. I had not looked too closely at this transaction before, but just assumed that because our university pays for the insurance on my behalf – to itself – it is not income. As I’ve investigated grad student taxes for my community service project, though, I’ve come to understand that this insurance money is supposed to be considered taxable income. However, I can’t convince Kyle of that point! So in this post we’ll each lay out our arguments and you can weigh in with your experience and (hopefully) superior knowledge – I want to hear from grad students, tax pros, and anyone else with an opinion! 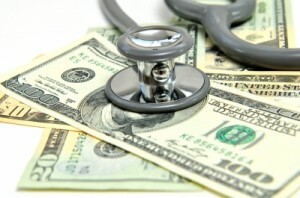 According to the IRS: “In most cases, the value of accident or health plan coverage provided to you by your employer is not included in your income.” The exceptions to this are for things like health savings accounts and cafeteria plans, as well as benefits (compensation you get for being injured or sick). 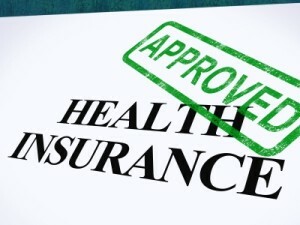 The health insurance that we are provided is just a normal group health insurance plan and falls under the general health plan coverage that isn’t included in your income. For this money to be taxable I would have to be paying for my health insurance individually. However, I would not even have access to this plan if I tried to pay for it by myself. Therefore, it can’t be income, because as an individual I wouldn’t be able to get this plan, so I can’t be individually paying for it. Also, if I opted out of my health insurance I would not be paid this money. So it is definitely only for the group insurance coverage that my employer is paying for me. Regardless of how the money actually gets to my insurance company, the money is going towards an employee provided group coverage which according to the IRS should not be included in my income. One of the principles that has crystallized for me through my study of grad student taxes is that every bit of money you have coming in is potentially taxable and it’s up to you to convince the IRS that parts of it are not taxable. In many cases, the income to the Bursar account is balanced out by charges to the Bursar account. If the charges are qualified tuition and fees, those can be directly subtracted from the income as deductions. For example, a charge for tuition and money posted from the department for tuition, if equal, would balance out and net to zero income. For several years, all the income to and charges to my Bursar account have balanced (therefore I receive no 1098-T, which at my university is only issued if qualified tuition and fees is greater than income to the Bursar account). So I thought that because the income and charges all balanced I could disregard the transactions in the Bursar account. However, now I know that to be rigorous, I should have been adding up the income to my Bursar account and then subtracting the qualified tuition and fees to find my net income from that source. The key point here is that health insurance is not a qualified fee. It appears explicitly in an IRS list of fees that are NOT qualified. So even though this designated-for-insurance income and the insurance charge feel just like the income and charges for tuition, health fees, etc., it is not the same. It is not a qualified fee so the income designated for it has no deduction to balance it out and therefore our net income to our Bursar accounts is the cost of the insurance. Even though this money never passes through our bank accounts, it does pass through our names in the Bursar account, so I guess that makes it ours. I should point out that I have never spoken to a grad student who told me she pays tax on the insurance charges paid on her behalf. I think no one knows about this or believes that this is the right way to file! But my partner and I researched the situation independently and haven’t found a way to justify the insurance money as not being taxable income. Kyle and I need to resolve this issue, both so that we can file our taxes and so that I can let other grad students know the right thing to do, so I would like additional opinions! I would love to reduce our overall tax burden but I want to do it legitimately. Do you think income to the Bursar account for health insurance is taxable income or not and why? If your university pays your health insurance indirectly like this, have you paid tax on it? 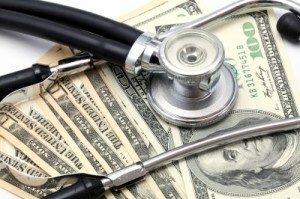 How is your health insurance provided by your employer and is it taxable? Is there anything we missed in this analysis? 46 Responses to "Disagreement Over Grad Student Health Insurance Taxes"
To me it would appear that it is taxable because it isn’t a qualified education related expense. I think the main thing here is that you aren’t considered an “employee” so it isn’t an employer provided healthcare cost (even if they are providing money to cover it). The issue is that the money the are providing isn’t linked to any required work, so you aren’t paying FICA on it right – which means it isn’t “earned” income. Anyway, not an expert on this in any sense but I think Emily is right. I think I read that thread before, actually… It’s hard for me to get through it because of the misinformation! That’s the problem with asking the internet subtle questions! So actually what you’ve said is a bit incorrect – earned vs. unearned income, FICA exemptions, and employee status are all separate issues and you can’t necessarily use one to inform the rest. We are paid with W-2s so we have earned income but we are also students so we have FICA exemptions. In some ways the university considers us employees (we are on compensatory payroll) but we are still definitely students and not full employees with access to all benefits like 403(b)s.
Yeah, you definitly have a bit of a complicated situation 🙂 Glad I am not dealing with grad student income at the moment. I think the answer still does depend on what source of money is paying the health coverage though right? If it is money from “scholarships or fellowships” then it would seem not to be a qualified expense. Curious if your W-2s lists out employee paid health coverage (mine does)? I second the vote on figureing it out yourself though as paying someone to do it for you might get you the right answer but it won’t help you learn. And they are known to be wrong as well. I tried talking to the IRS about a personal loan question we are dealing with and they flat out gave me the wrong answer about imputed interest on loans below the Applicable Federal Rate. Since the money is posted to the Bursar account the assumption is that it is from scholarship/fellowship income but I can’t quote from the IRS on that since it’s university policy! If the university issued us 1098-Ts, I think they would list a gap between scholarships posted and tuition and qualified fees paid (income higher), but since scholarship/fellowship income is not higher they don’t issue the 1098-T. Ugh! I definitely want to understand these issues myself, but the more I understand the more outraged I get! Not necessarily about having to pay tax on this bit of income but because the universities/IRS make it SO DIFFICULT to understand what’s going on! The reason I don’t really trust the IRS to have all the right answers (and therefore also not tax preparers) is because a few years ago Kyle and I both got amended returns back from the IRS over what they saw as the exact same mistake. Kyle called up and was able to convince them he had been right; I called up and failed to convince them I had been right. Over the exact same issue. It just makes me want to throw up my hands! And this kind of stuff is why we finally hired a tax guy. Because both answers seem reasonable, but only one can truly be correct. And to know which one requires a lot of knowledge of the nuances of the tax code. If I were in your shoes and didn’t want to hire a CPA – not sure I’d trust Joe Schmo from Liberty Taxes on this one! – then I’d look at the withholdings rates. We always had taxes withheld from our stipends, so they can be a comparison. Are the witholdings rates for taxes applied to the health insurance “income” or are they based solely on the stipend money. Once you figure that out, then I’d probably feel comfortable applying the same theory going forward. And then I’d hold my breath for 3 years hoping not to get audited… Good luck! I don’t think we need a full-time tax preparer for a question like this – just a reliable source! The thing is, the IRS itself doesn’t know the answers to some of of our questions so I don’t know how a tax preparer would. We have taxes withheld too but I don’t see how they would connect to this insurance money. Payroll and Bursar are two different systems so why would our withholding rates, set through payroll, know what’s going on with the Bursar account? And like Kyle said, we wouldn’t receive this money if we had insurance through our parents, which payroll also doesn’t know about. I’m not too afraid of making mistakes with my tax returns if they are honest, but now that I know about this insurance question I want to do the right thing. The key is the employee-employer relationship. If you’re paid by fellowship, you’re not an employee of the University, and so the health insurance they provide is taxable as income. Very good point. What page is that quote from? We are not paid by fellowship (except for this portion, I guess) but we are still only sort-of employees. It’s weird – sometimes we’re classified as students and sometimes as employees, but we’re sort of both since we are on compensatory payroll and we definitely aren’t full employees with access to all the benefits. I’m on fellowship, I also have a box 12 DD note, but unlike most people, my DD amount is actually included in box 1 above and beyond salary. In other words the taxable amount in box 1 is the sum total of all the withholding, all the money that hit my bank account as take-home, PLUS some magic number also reported in box 12 DD as cost of employer-provided health insurance, (paid by my non-employer). Confusing how they can do that but I guess it’s clearer on their intentions for your taxes? I really need you to guest post sometime on postdoc finances since you seem to have a good grasp on yours! Emily, you are probably technically right, but my gut wants to side with Kyle. It just doesn’t seem right that you’d have to add insurance money to your taxable income, even though it sounds like you’ve pretty much proven that you need to. What would the dollar impact to your taxes be? My gut is to side with Kyle, too – and in the past we were unaware of this issue at all! It will cost us about an extra $1,000 – over $4k in extra income, taxed at 15% federal plus about 8% for state. Our withholdings are usually within about $200 of what we owe not considering that income, so we’ll have to pull that $1k from savings unexpectedly and adjust our withholdings to be a bit higher going forward. I wonder if the health insurance and tax laws have changed in the last few years. It’s only been in the last year or so that the employer portion of the healthcare contribution has shown up on my W-2. When I was in grad school (and receiving a W-2), the healthcare costs paid by the university didn’t show up. It seems like it could be a little bit of work to figure out the exact amount of their contribution unless it shows up on a W-2 or something like that. My grad school insurance contribution ran on a 10 month school calendar and the rates were different in September and January-May. It’s not on our W-2s but it is clear in the Bursar account… I’ll add an image to the post. So it’s not hard to figure out what the amount is, just difficult to understand if what’s posted to the Bursar account is really part of our income and whether or not it’s balanced by the charges from the university. The key words being “your employer”. The reason it is not considered income is because as an employee, your employer can deduct your health insurance cost as a pre-tax benefit. This lowers your taxable income. Not the same as having insurance paid on your behalf as a student. Sorry, but I agree with Emily. I’m so glad that people have pointed out that distinction here because it’s not one that either of us focused on – very good insight! I think that unless the amount was included on a W-2, a 1099, or some other tax document, you don’t owe anything and it isn’t taxable income. Have you tried asking the burser’s office? While logical, this is unfortunately not true. The universities aren’t required to report certain types of pay to the IRS and so they sometimes also don’t report it (directly, with neon signs) to the students. Fellowship/scholarship income is one of those types of pay, so all we have are our Bursar records. I am Canadian, and here we don’t have to claim our benefits or anything health related as income. But I think a call to the IRS would clear this up. Unless you’re getting mixed information from them, too! I haven’t tried them on this issue but I should. Thanks for the suggestion! I will find some time this week to call them up – or maybe Kyle can do it since he’s more convinced we shouldn’t be taxed on it. 2014 taxes are coming around and I am looking into this very issue and haven’t come to a conclusion. However there are some arguments that you did not touch, and also I would like to know what the outcome was of your decision. Firstly, my situation: I receive a W-2 with my entire stipend (with taxes withheld, everything there is hunky-dory) along with a 1098-T which has box 1 (payments received for …) and box 5 (scholarships and grants) filled out. 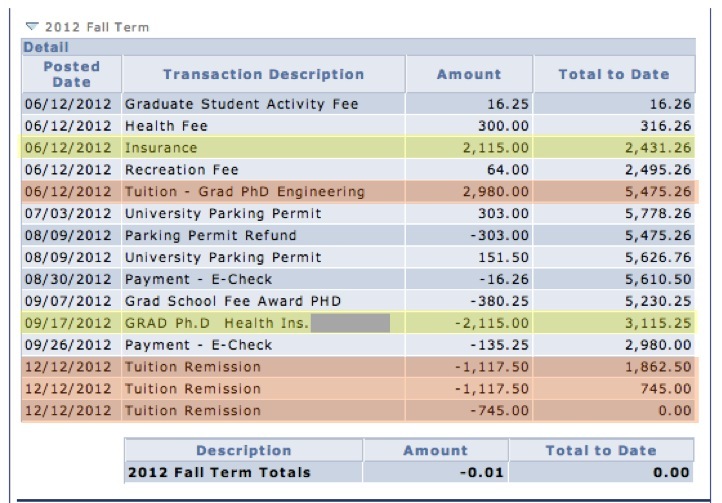 The 1098-T covers everything that is not part of my stipend (tuition, fees, and health insurance). Box 1 is almost equal to the sum of “___ Qtr 2014 Registration Fees” in my ‘bursar’ account (shy by ~$100) and Box 5 is the sum of the tuition/fee remissions posted to the ‘bursar’ account. The difference between Box 5 and Box 1 is the sum of the “Mandatory Health Insurance – Graduate” in the ‘bursar’ account plus that mysterious ~$100. I am not able to intervene on these credits/debits in any way, but I can see that they occurred. First, if you are considered self-employed, 100% of health insurance premiums are deductible [see http://www.irs.gov/uac/Newsroom/Dont-Miss-the-Health-Insurance-Deduction-if-Youre-Self-Employed%5D. I know you have stated else-where that a graduate student is not self-employed/contractor, but TurboTax (at least) applies self-employment tax on the overage on a 1098-T (without asking any questions like it does for 1099-MISC), implying it is a ‘self-employment’ situation. However it also does not let you directly put the 1098-T in as income under the business section. This implies that the 1098-T funds are self-employed and that health insurance should be deductible. This does not cover other situations with 1099-MISC. Second, this seems like it should actually be a pre-tax health insurance situation. In big businesses, health insurance is usually paid pre-tax from the group policy for the company. From my small experiences, you can see the same sort of transactions of the health insurance being changed and paid-for in your name, but it is not taxed. This seems to be the same situation which means I should not be paying any taxes on the health insurance. My pay was the pay after the health insurance premiums were taken out for me. And third, special to my situation, I am separately self-employed, but I am unsure if I can declare those health insurance premiums as part of that business and get 100% deduction (actually, I can’t get 100% because the net profit for the side business is less than the health insurance premiums, but you get the idea). Thanks for a wonderful blog and info. Hope you have some ideas! Contacting my program’s admins they have told me that: “You should not be taxed on this amount and do not need to claim it as income” (in regards to the 1098-T form, in particular the extra money listed on there which was for health insurance). While they cannot answer tax questions, this is not really a tax question per-se, but really an income question. Thank you so much for your comment and adding your thoughts to this discussion. I want to caution you against trusting TurboTax too much for complex issues like the one you’re dealing with. TurboTax starts off by assuming that any 1099-MISC income is self-employment income, when in fact it is only box 7. Graduate students, if they receive 1099-MISCs, should have their income in box 3. However, TurboTax does not get into that level of detail, at least not in the free version. I don’t have personal experience entering a 1098-T into TurboTax because actually my university does not issue 1098-Ts in your (and my) situation (income > expenses). Why would some students have undocumented self-employment income and other students have documented self-employment income? I think it is all scholarship pay, which the universities do not have to report (but some do). So that is another wrench in the story. I have looked into your second argument but haven’t found enough really good evidence to write a whole post on it. My best guess is that health insurance premiums can only be deductible if they are paid through payroll and your taxable income automatically reduced in each paycheck (my husband has this situation with his postdoc, thankfully). While it would make logical sense that this could apply to Bursar-billed health insurance premiums – and I wish it were so – I just haven’t seen the documentation to justify the position. Please let me know if you do find some definitive IRS documentation on this issue. I think your last question on the self-employment part is a good one for a professional tax preparer (unfortunately). It makes sense that you should be able to deduct at least a portion of the premium (again, logically – not necessarily code-wise). I also want to apologize for taking so long to respond to you. Normally I respond within a day or so, but in the last week I have moved and started a new job. :/ I hope to be back to my normal response time soon. BTW what is the self-employment income that you have in addition to your role as a grad student? My main reason for “needing” TurboTax is for my side business, and I pay for the home. It handles tons of situations for this like home-office, asset depreciation, and what not that would be difficult for me to do on my own with everything else going on (maybe one day when I am only doing my own business and not grad school I will figure it all out – especially since they have been dramatically raising the price of that version every year). Typically I have it do just the federal since my state just takes the AGI from federal and applies its taxes (so I just need to copy some numbers and don’t have to worry about all the business stuff). My side business is from software I sell. I wrote the bulk of it before graduate school, but still sell and support the software now. It is only a few hours a week now and my grad program knows about it and hasn’t made any fuss about the whole being employed during grad school thing. My school does the 1098-T electronically, so its not like they are wasting their time doing it for me, it is probably just done for every student by a program some where. * In some cases, the boxes are different because the scholarships come once during a year and tuition payments come piece-meal, in these cases it is supposedly not a source of income either. Those combined with what my program admin said, I am going with the fact I do not need to report it, treating it as a pre-tax health insurance premium payment. The years I had 1098-T that had actual income on them (of which I hopefully will never have again) I did pay taxes on all of the overage, it was mostly income then (actual income, part of the stipend). At the end of it all, I just have to agree with C@thesingledollar, the system is nuts. The forms aren’t designed to handle this in any meaningful way and there is no official documentation one way or the other. In terms of using the health insurance premiums to deduct from my actual self-employed income, I am less sure about it. TurboTax explicitly states “If you or your spouse could participate (even if you declined coverage) in an employer’s health plan at any time during a given month, you cannot take the deduction for that month.” Which, since I am being offered insurance by my employer – the school, tells me I cannot claim it. Additionally any marketplace plans are non-deductible. I agree that my reading has indicated that the purpose of the 1098-T is to help students get tax credits, which is why my university doesn’t issue them if scholarship income exceeds qualified expenses. I tend to ignore the 1098-T but go straight to the Bursar account to discover what the posted scholarships are. I think we can definitely agree that insurance premiums are not qualified fees so they are not exempt for that reason, so the difference of opinion here (and I think that’s what it comes down to) is whether Bursar-billed insurance premiums can be deducted. I don’t think the situation qualifies, but you (and my husband) do. I understand the logic of your position, and I hope you understand the lack of explicit documentation that provokes my position (we’re not employees, so we can’t take payroll deductions, and Bursars are not payroll). In any case, I think you just need to do your taxes in good faith (as I do), and if you/I end up making a mistake maybe it will pass and maybe it won’t, but either way we’re not talking about much money. 🙂 My main sticking point on taxes stuff is just that people not try to get out of paying taxes that they KNOW they should. This point is certainly disputable! Still not clear on taxable or not?? Saw the new comment on the home page and was curious, so I came over to read. This is all a reminder that the way the IRS and universities collectively treat graduate students is *completely nuts*. If a fellowship is income, then students are employed, damn it, and should get employee health insurance and a W2 like normal people. If it isn’t income (and for the purposes of SS and Medicare it isn’t; and the university doesn’t have to report it to the IRS…why exactly?) then why is it subject to income tax? The even more nutty thing is when you get multiple forms of payment due to multiple funding source. This year I get a W-2 with my entire stipend and 1098-T with whatever. In some years I get my funding from multiple sources, and due to NIH restrictions, that can’t all be delivered to the grad student in the same way. In those years my stipend has been split between a W-2, a 1099-MISC, and a 1098-T! Every month I would get multiple deposits in my bank account to cover the money coming from the different sources (each deposit being a different source, contributing to one of the different forms). I believe that 1098-T should completely remove box 5 and 6 and those should always be reported via a different form (e.g. W-2 or 1099-MISC) if they are meant to be taxable. I KNOW. It’s totally crazy, and it doesn’t necessarily get better for all postdocs! We are in such a strange gray area as sort-of-non-employees. My institution does give me a 1098-T even though box 5 is greater than box 2 (box 5 = tuition reimbursement + health award). Because my university covers health insurance for my entire family, the health award is over $13,000, so I wish I didn’t have to report it as taxable income, but I agree with you that it does count as such. I also, however, claim the same amount as health insurance premiums for a medical expenses deduction. Even though I only see the money going in and out on my bursar account and so it doesn’t feel like I directly pay for the premiums, if the IRS wants to count the incoming line as taxable income then I think I’m justified in counting the outgoing line as post-tax medical expenses. I looked it up and I think your approach is valid if you are itemizing your deductions since I’m guessing $13,000 is more than 10% of your AGI. Thanks for your question as it spied me to research this in a new way! Unlike chapter 6 you linked to, this page doesn’t explicitly call out insurance as an exception. I have yet to come across a university that doesn’t require a minimum amount of health insurance, so something is definitely required. However, I don’t think health insurance failing to appear on a list of not-qualified-fees means that it is a qualified fee, only that that particular list is less complete than the one I linked to. each credit has its own list of specific inclusions and exclusions (e.g. QTPs allow room and board, etc). The wording about insurance appears only for the AO, LLC and T+F deductions. So as far as I can tell, pub 970 doesn’t settle the question either way. Hmmm, yes, now I see what you are saying. Instead of assuming the scholarship is taxable and then trying to take a qualified fees deduction, you are wondering whether a scholarship going toward a required insurance fee should be taxable in the first place (whether it is a qualified education expense). This is certainly a different way of constructing the argument than I’ve thought of before. It would be much better if insurance explicitly appeared in the qualified or non-qualified list in that section, I agree. I’m not sure how to come to a good resolution on this question. I’m looking into this issue for my 2015 taxes. My understanding is that tuition and fees that are required for enrollment (qualified education expense) may be deducted from fellowship (unearned income). Since Stanford requires health insurance, it may be deducted from fellowship income. Housing and meal plans are not required, therefore not deductible – even though we wish they were! The Stanford website corroborates this interpretation. http://web.stanford.edu/group/fms/fingate/staff/supptstudents/tax_students.html I am going to deduct the few fees I had to pay out of pocket and my half of the health insurance payment as qualified education expenses. That said, I’m a bit terrified that I will get audited down the line and be stuck paying a huge amount of back taxes so I could save a couple of hundred bucks this year…. it’s a tough call. Honestly, I wouldn’t worry too much about an audit. Just do the best you can! While the Stanford website lists health insurance as a qualified education expense, that is in conflict with Publication 970 Chapter 6. I agree this is a matter of interpretation, as Chapter 1 is the more relevant and it is silent on health insurance as a qualified education expense. Also, you don’t have to use the health insurance plan Stanford provides, just have health insurance – right? That would mean that it is not a required fee. This comment section was a very interesting read! I am a postdoctoral researcher (so not a grad student, I’m sorry). To make it even more complicated, I am a foreigner. For tax years 2014-2015, I am considered a non-resident alien for tax purposes, thus filing 1040NR instead of 1040. In my stipend, reported on a 1042-S (foreign person’s US income), the health insurance for my wife and I paid by the university is included in the gross income. Unfortunately, if you file a 1040NR, you cannot deduct medical expenses, so for 2014-2015 I can find no way to avoid taxes on my health insurance premiums. However, for tax year 2016 (I’ve already made preliminary calculations to figure out my estimated taxes) I will be a resident alien, and file a 1040. Then I assume that I can use Schedule A and deduct premiums minus 10% of AGI, which combined with my state tax is much more than the standard deduction. I’d be interested in hearing the experience of other postdocs and grad students making this deduction in terms of getting an audit. It actually seems like non-residents in some cases can elect to file as residents for tax purposes, but I am not sure if it would be worth the hassle of doing this for 2015. Unfortunately both of those sources are quoting IRS language used in sections of Publication 970 not referring to scholarship pay… It gets really mixed up!